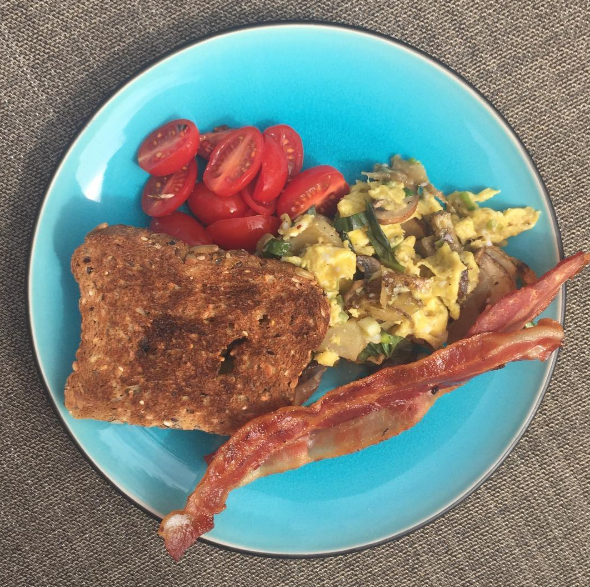 A delicious egg scramble with mushrooms, roasted potatoes, green onions & basil. The best thing about scrambled eggs? They are great on their own, served simply with green onions or filled with leftover veggies. Pack more veggies in at breakfast by adding your favorites to eggs. When eggs begin to scramble, push to side of the pan & add vegetables. * Veggies that are great to add to scrambles: onions, bell peppers, zucchini, spinach, arugula, mushrooms, basil, green onions, broccoli, asparagus, green chilies, sun dried tomatoes & artichoke hearts.